This legendary seaside resort has all the glitz and allure of the Côte d'Azur: private beaches, marinas filled with luxury yachts, stylish boulevards, elegant Belle Epoque hotels, and fashionable restaurants. In an enchanting setting on Golfe de la Napoule bay, Cannes is blessed with a balmy Mediterranean climate. The weather is mild year-round and perfect for sunbathing by the beach from May through October. Leafy palm trees grace the streets of Cannes, and subtropical flowers flourish throughout the city, giving visitors the impression of being in paradise. The prestigious Film Festival of Cannes has been an important event since it began in 1946. Drawing famous movie stars from around the world, this annual red-carpet gala has earned an international reputation for promoting the art of filmmaking. One of the most fashionable streets on the French Riviera, this palm-lined boulevard is the center of tourist activity in Cannes. The Boulevard de la Croisette is lined by Belle Epoque hotels, such as the historic InterContinental Carlton Cannes, a marvelous example of grand French Art Nouveau architecture, designed by Charles Dalmas. Visitors can also admire the opulent villas and upscale boutiques. The boulevard extends from the new Palais des Festivals to the lovely "La Roseraie" park at the Square du 8 Mai 1945, with splendid private beaches on the sandy shoreline. Along this stretch, the beachfront promenade is a great place for strolling and people-watching. The promenade is appreciated for its magnificent views of the gulf and the Lérins Islands in the distance of the Mediterranean Sea. Perched on the slopes of Mont Chevalier above the bay, the Le Suquet district represents the original fishing village. In a picturesque hillside setting, this area offers exceptional views as well as Old World charm. Le Suquet has retained some of the ambience of centuries ago. Tourists are delighted by the traffic-free quarter with its narrow old staircases, pleasant courtyards, and interesting historic remnants, such as the city's ancient walls. At the heart of Le Suquet, the old church, Eglise du Suquet, and the 11th-century Tour du Mont Chevalier watchtower dominate the skyline. From the top of the watchtower, there is a wonderful panoramic outlook onto the beach and the bay all the way out to the Lérins Islands. Another joy of visiting Le Suquet is wandering the quaint old streets. One of the old town's main shopping streets is the Rue Meynadier. This bustling pedestrian street is renowned for its specialty gourmet boutiques. Another important commercial street a few blocks away at the edge of Le Suquet is the Rue d'Antibes. A shopping destination for French Riviera fashions, the street is lined with designer prêt-à-porter clothing boutiques. The Palais des Festivals et des Congrès is the venue of the Riviera's most glamorous red-carpet affair, the Cannes Film Festival. Designed by the architects Bennett and Druet, the building was completed in 1982 and is used for events, conferences and festivals year round. In addition to the film festival, the building also hosts the G20 Summit, the international music trade show MIDEM, and the MIPTV (International Television Programme Market) events. The Palais des Festivals has 25,000 square meters of space for exhibitions as well as numerous rooms and auditoriums equipped with sophisticated sound and lighting systems. The impressive complex of buildings features state-of-the-art technical apparatus, including sound studios, simultaneous translation arrangements, audio-visual equipment, and large projectors. There is also a restaurant on site. Since 2009, the building has been continually modernized. Built on the summit of le Suquet, which dazzles with its dreamy views of the city, the Notre-Dame de l'Espérance is the most important church in Cannes. The late-Gothic edifice dates to the 16th century and has a notable 17th-century Madonna on the high altar. When entering the church, visitors are struck by the peaceful interior and the inspiring heights of its Gothic vaulting. The church also features a mix of architectural styles, including a Renaissance porch plus an organ that was installed in 1857 and has been recently renovated. There is also an old cemetery that dates back to the 16th century. During the Second World War, the church was temporarily used as a hospital. Today, the church is still a place of religious worship. In July, the square in front of the church is illuminated and becomes a magical outdoor venue for the Nuits Musicales du Suquet (Musical Nights of Le Suquet), a classical musical festival featuring one week of performances under the stars. On a hill overlooking the Bay of Cannes, the Musée de la Castre occupies a classified historic monument, a medieval castle that was formerly the monastery of Lérins monks. Surrounded by a Mediterranean garden, the site boasts exceptional views of the coastline and sea. The Castre Museum has a superb collection of Mediterranean antiquities, pre-Columbian primitive art, and 19th-century Provencal landscape paintings. Several small rooms feature exotic art objects from Oceania and the Himalayas. There is also an extensive collection of musical instruments from around the world. Visitors can climb to the top of the building's 12th-century tower to take in the breathtaking 360-degree panorama of Cannes and its surroundings. Emblematic of Cannes' Mediterranean scenery, the Vieux Port (Old Port) lies below the historic Le Suquet quarter. The Vieux Port, also known as Port Cannes I, is located near the Gare Maritime (Marine Railway Station) that was built in 1957. Besides its use as a dock for yachts and other sailboats, the Vieux Port is the launching point for the Royal Regatta. North of the port are the picturesque Allées de la Liberté, narrow ancient alleys lined with shady plane trees. In the mornings the colorful Marché aux Fleurs (Flower Market) is held here. This lovely district of Cannes exemplifies glamorous French Riviera scenery. Gorgeous vacation villas are surrounded by lush gardens and palm trees. This charming area is a wonderful place for a relaxing afternoon stroll. Drawn by its beauty, Picasso lived in this neighborhood for a short while. It's easy to understand how the exquisite buildings and vibrant landscape would inspire an artist. Also worth a visit in this neighborhood is the Eglise Russe (Russian Church) on the Boulevard Alexandre. Built in 1894 by the Count Vitali, the Chapelle Bellini was once part of a Florentine-style villa and is set in a beautiful park. Identified by the arms of the Count, the chapel features an Italian Baroque design with an impressive clock tower and an interesting wooden staircase inside. The chapel was bought by the artist Emmanuel Bellini in 1953 and then used as his atelier. The Bellini Chapel is now a museum dedicated to the artist's works shown in his own studio space. La Malmaison Museum occupies the game room and tea room of the Grand Hôtel, built in 1863. These rooms were used for art exhibitions organized by Aimé Maeght in 1945 and were converted by the city of Cannes to a museum in 1983. This small museum invites visitors on a delightful discovery of contemporary art. The museum hosts two major expositions annually dedicated to famous artists who found inspiration from the Cote d'Azur, including Picasso, Matisse, and Ozenfant. Other internationally renowned artists featured in the museum's collections are César, Miró, and Masson. For several nights every summer in July and August, the Bay of Cannes lights up with its renowned Fireworks Festival. This unique international event brings together the best fireworks designers from all over the world. The festival began in 1967 and draws thousands of spectators along the beaches of Cannes. Each night of the festival offers excitement and an array of dazzling fireworks. The top pyrotechnic team receives the Vestal Prize at the end of the fireworks competition. The audience can vote during the competition for their favorite fireworks, and winners are awarded the Prix du Public (Public Prize) along with prizes to stay at luxury hotels. Fireworks programs begin at 11pm and are open to the public for free viewing. The Nuits Musicales du Suquet is an annual classical music festival that runs for one week in July. Taking advantage of the balmy Côte d'Azur weather, the event is held outside in the courtyard of the Church of Notre Dame d'Espérance. This world-class festival includes both large symphonic concerts and smaller solo performances by violinists, pianists, and vocalists. The repertoire features a varied list of classical musical pieces from Mozart to Chopin. Luxury Hotels: With the Belle Epoch elegance and service that made Cannes hotels famous, Hotel Barriere Le Majestic Cannes is opposite Le Palais Des Festival. One block off Boulevard de la Croisette, the boutique Five Seas Hotel has beautifully furnished rooms and a rooftop infinity pool. The somewhat old-fashioned rooms at InterContinental Carlton Cannes, overlooking the beach on Boulevard de la Croisette, add to its atmosphere of classic grand hotel. Mid-Range Hotels: About 300 meters from the beachfront Boulevard de la Croisette, Hotel de Provence has balconies, a garden, and a rooftop terrace. The boutique Hotel America is one block off Boulevard de la Croisette and less than five minutes from Le Palais Des Festival and Rue d'Antibes shops. Cozy and intimate, the Hotel Festival sits between Boulevard de la Croisette beaches and Rue d'Antibes shopping and has a Jacuzzi and sauna. Budget Hotels: On the hill above the old town, a 15-minute walk to the center shops, restaurants, and beaches, Ideal Sejour Hotel offers a beautiful garden; fresh baked croissants every morning; and creative, well-designed rooms with literary themes. With small rooms and excellent service, Hotel des Congres et Festivals is a short block off Rue d'Antibes, close to both the beach and train station. Also a short walk to the beach and train station, Hotel Ibis Cannes Centre offers small, plain rooms a block off Rue d'Antibes. Monaco and Eze Day Trip: The Monaco and Eze Small Group Day Trip from Cannes blends the best of the French Riviera, with plenty of village charm and fast-paced fun. A professional guide will pick you up from your hotel in an air-conditioned minivan to visit the medieval hilltop village of Eze, where you can tour a perfumery. After strolling around this delightful village, you head to Monte Carlo for a spin on the Formula One Grand Prix circuit and a palace visit. This full-day adventure is a small-group tour for a maximum of eight people. Provence Countryside Day Trip: If you want to focus on the quaint villages of Provence, the Provence Countryside Small-Group Day Trip from Cannes is an excellent choice. 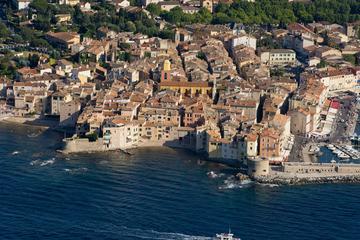 Highlights of this tour include a visit to St. Paul de Vence, with its galleries and picturesque public squares; the hilltop town of Gourdon; a perfumery tour in Grasse; and a drive along the scenic Loup Gorges, past other quaint villages. This full-day tour is also limited to small groups to maximize personal attention. 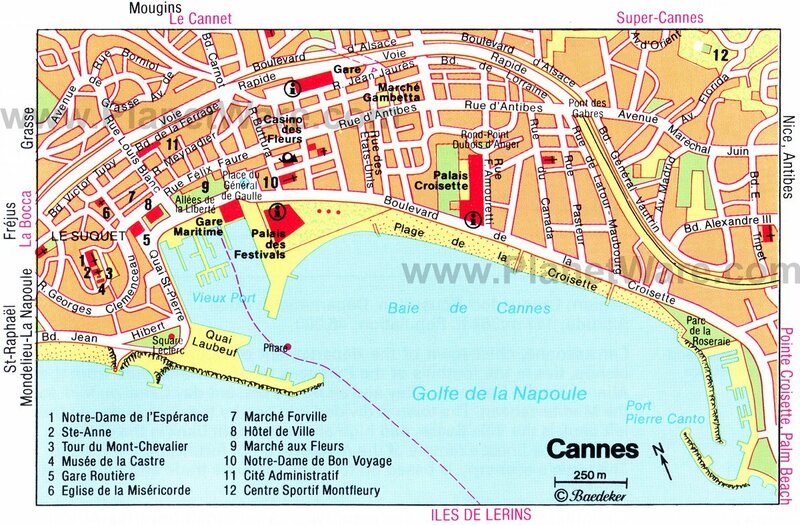 Cannes is an excellent starting point for a beach vacation on the sunny French Riviera. The pristine, sandy shores of Antibes are only 30 minutes away by car or 15 minutes by train. The stylish and cultured city of Nice is about 30 minutes by train or 45 minutes by car. 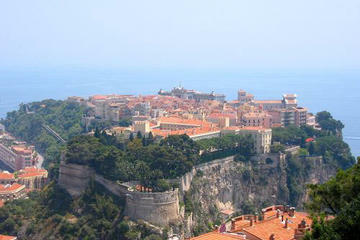 The regal city-state of Monaco is one hour away by train or car. To further discover the beauty and charm of the Côte d'Azur, travelers can visit smaller seaside villages around Nice, like Eze and Beaulieu-sur-Mer, and Fréjus and Saint-Raphaël near Cannes. For those interested in experiencing the unspoiled nature and pastoral ambience of Provence, it's worth taking a trip to the dramatic Estérel Mountains (a 45-minute drive) for breathtaking views or to the traditional Provençal town of Grasse (the perfume capital of France) an hour drive north of Cannes.